It was not as good as you could have done, for sure! 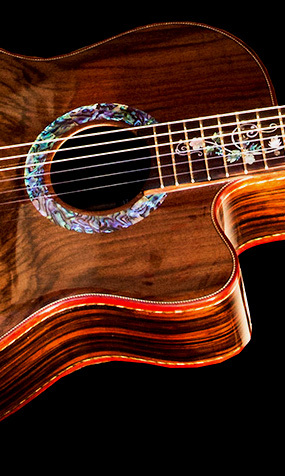 The guitar has aged to a sweetness that is hard to believe. It was probably the best I have ever sounded. Wanted to take a moment to give you my sincerest thanks for a beautiful guitar. I’ve only had it in my hands for a few hours but already I know I have a new friend that will travel with me for the rest of my life. May you, your family and your team continue to find peace and prosperity all the days of your lives. Hello my name is Erik J Heinrich and I am the proud new owner of 'Gloria', a Bellucci Crown Custom Limited Edition S.D.G. 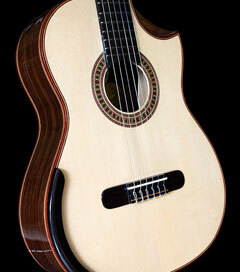 Signature Series Concert Classical Guitar. 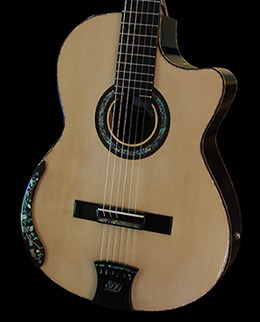 can honestly say that she is one of the finest Bellucci Guitars ever built by the Bellucci team of Luthiers. I can attest to this very fact because Gloria is absolutely beautiful and she sounds even more beautiful than she appears to be and she's most comfortable to play as well. 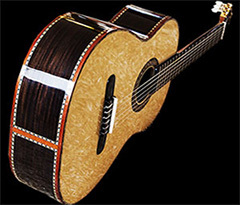 The workmanship that went into building this guitar is absolutely astounding and 'Gloria' is impeccable to say the least. 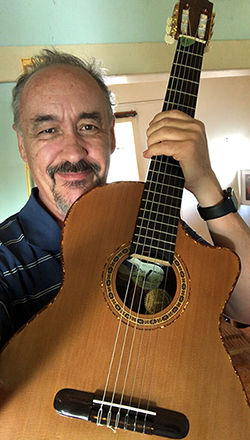 I am very grateful for Bellucci Guitars Master Luthier Domingo and his team of Luthiers who put their best efforts forward along with their commitment and dedication, their relentless energy and their loving care that brought 'Gloria' into existence. On Sunday a package arrived here that looked like it could have traveled to China and back and still arrived safely. 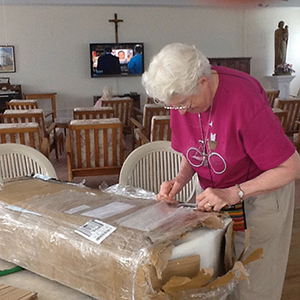 The reason for my first thank you -- the care you took in wrapping Renata. After I opened the package, there she lay, more beautiful than ever. Please thank Domingo and the other luthiers for their skill and then yourself, for the care, devotion, and expense you put into building her. A few months ago you wrote "we will make this come out better than before" and you are certainly a man of you word. She is perfect. Just waiting to be held and loved. The reason for my second thank you. I tuned her and then let her rest and get acclimated to our humidity and today I will let my fingers accustom themselves to her specifications, which will be a loving task, but one I will approach with humility. I can see that she has a sweet side, but there is a boldness about her. I will have to over come my timidity to approach her courageously. This is the reason for my third thank you. Please ask Belén to give you two huge hugs, one from Renata and then one from me. She is so beautiful and so well made -that alone would be reason for praise. After playing her every day now for a month, I feel that Aphelia is a beautiful work of craftsmanship, art and performance. I have come to understand that she has great character. From the very first, I could hear magnificent resonant lows; and her trebels were clear like the most beautiful of bells, but over time I have learned more. When alternating between playing her and my other guitars during one session, I have become very aware that she is different -and that she is very much superior. Her sustain is spectacular and lasting, yet ghost notes are not an issue and that is not something I can say about my other guitars. Renato, your double-top construction technique is awesome. Typical of a truly great instrument, her sounds are very much her own: spectacular and true, and yet uniquely hers -simply put, it makes me smile every time I have played her. When I set her down to play other guitars, I miss her. I am very glad that I decided to order this guitar from you; it was a month in ship time to Boise but now I know it was well worth the wait. I also know what a really well-made, hand-made guitar can be; and no guitar I have ever held even comes close to being as good as Aphelia. Renato, thank you again. You are an honest and amazing Maestro, and your guitar is far better than any I have ever touched. The work of your hands is amazing and it is good that you dedicate this work to the Glory of the God. Renato, you may edit and use any part or parts of my email as a reference or testimonial. Bruce is retired CEO of National Tech Labs, Inc., his life and forte for many decades was quality-control assembly and infinite fine-tuning of inventions. God only knows how much your review means to me. Maestro: Llegó "Campana" y estoy sumamente complacido. Ha sido Ud. paciente y sumamente desprendido. 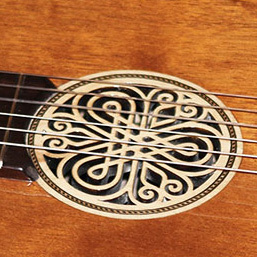 La primera impresión es que la guitarra es espectacular. Sobre todo me gusta el sonido. La maquinaria comparada con la otra guitarra es como montarse en un Mercedes después de estar en un Chevy. 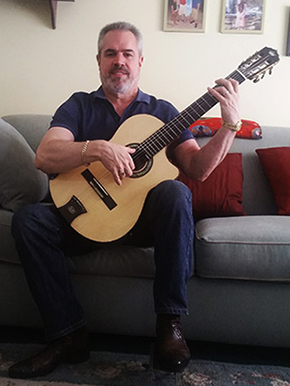 Mucho mas fácil de tocar que la otra guitarra, la forma del brazo, el diapason, en fin estoy encantado de la vida. Lo otro es que le había cambiado el estuche y la mando Ud. en el de cuero repujado, y me he quedado de una pieza, es una obra de arte. Estoy de prisa, pero solamente quería decirle que llego La Campana, sana y salva. Después me comunico con mas calma. Como decía Don Pedro Vargas: "Muy agradecido, muy agradecido, muy agradecido". PD. Informele a Roberto que estoy mas que agradecido y admirado de la calidad de su trabajo. The mail lady delivered the case & she wanted to stand & talk, normally I do too, but not today ! I wanted her to leave so I could open the case.... lol I very carefully peeled back each layer & I finally got to see a master piece. It is amazing. Thank you, thank you. I will do my best to keep it a secret until Christmas. Now my only problem is when are you flying here to re-wrap it?? Ha Ha I'll probably keep it hidden until he has opened all presents & just throw a huge blanket over it & have my husband carry it out. I am so glad I randomly found you on the internet. You have made my day & will make my son's Christmas! I hope you and yours are healthy and happy. Have been in Colorado for a month now. Can't imagine what it would have been without my newest Bellucci addition. It sounds as beautiful as it looks. After playing it the other night I said to my wife that our entire apartment seemed filled with guitar music, and she agreed. I miss all my other Bellucci's, but I'll have to wait until October to hold and play each one. 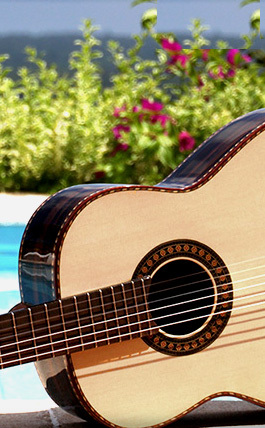 When we get home we will take a good photo of those wonderful guitars for your web site. and I moved on March 30.
out of your way to make this purchase possible. Well, all the best to you and your family. Of course it goes without saying that the guitar was delivered today. It is beautiful and worth far more than what I paid for it. The sound is beautiful, but I have not had an opportunity to do it justice, yet. My very grateful thanks for the more than expected work which you have done. I am overwhelmed. Although the guitar did not arrive in your usual crate, the packaging was excellent. A thin layer of wood on front and back of the case was surround by thick foam, with packaging paper and plastic to top it off - very secure. 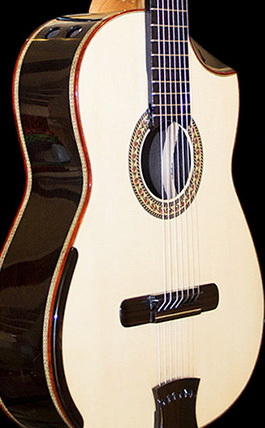 I'd say that this guitar is the most beautiful I own, except I can't because I own six other Bellucci's. 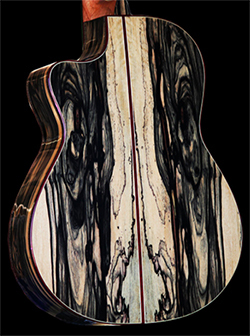 Two are cocobolo, two are Brazilian rosewood, one is Hawaiian koa, and one is tamarind. It is impossible to say which is most aesthetically pleasing to the eye. It's a matter of individual taste. This is the first guitar I have ever owned which has inlay on the fretboard. It is stunning, but I'll need to adapt to it while playing. In my eagerness, I tuned and played her already. I love its sound. We have artwork on all of our walls, much of it done by my wife, who is a fine water-colorist. But we have other types of art as well. 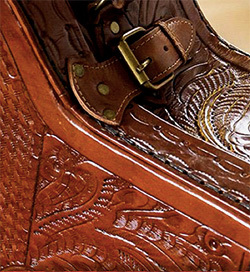 Some of our furniture is also artistically created. 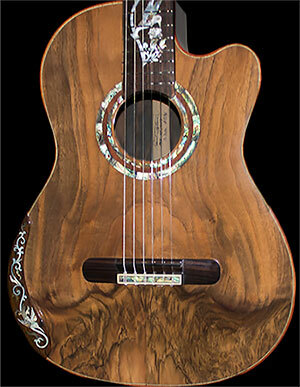 I wish I lived in a climate which allowed me to display my guitars you designed. They are each artistically created, and I play each with equal time and love. They motivate me to become a better guitar player. I do not refer to myself as "guitarist" because I am an amateur who plays for his own enjoyment. But part of every day of my life is spent playing music on the instruments I have obtained from you. They each bring me great joy. If I could only look at them and were unable to play, I would experience joy. 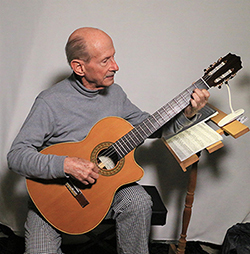 My classical guitar teacher (a true guitarist) is coming for a visit in about six weeks. I can't wait to show him my Belluccis. He will make them sound as good as they look. Thank you for another masterpiece. I will send a picture and a recording soon. Thank you very much for this outstanding masterpiece: true guitar artwork. The Tiger I have now been playing for about half a year and it has developed impressively in these months. Everybody loves the warm and rich sound and clear treble. I planned time for recordings during the Christmas break and am looking forward to it. guitar I got from you.